Call me Ishmael... I mean Captain Ahab. That is the official name of the fish now. Thanks to all who contributed and played along in our little game. We actually narrowed it down to those two names, but Jeffrey liked the deranged psycho captain better. 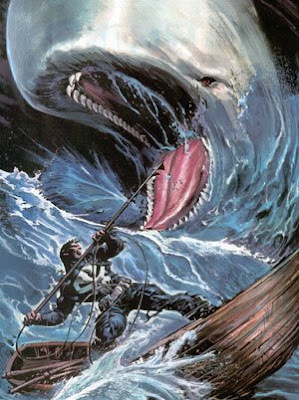 I think Ishmael rolls off the tongue a little easier, but Captain Ahab is rather psycho, which makes it all that more fun. We were thinking of Captain Nemo from 20,000 Leagues Under the Sea, but it would be annoying explaining the difference from the little clown fish, and the difference is incredibly important, so we are sticking with the other crazy captain from Literature. The winner of this fun game was... me! I know, it isn't fair, becuase I know the judge so much better than any of you, and I knew that we would have to name the fish something from history or something classic. Weird, I know. At any rate, the fish officially has a name, and thank you all for playing! We are off to The Great White North of the US... I mean Idaho for my niece's graduation. Have a great day everyone! Well, when I come and visit you, I'm calling him Alphie. oh good, i'm glad the baby got a name for the birth certificate;-) i've heard it's really hard to change it once you leave the hospital. That is a great name!